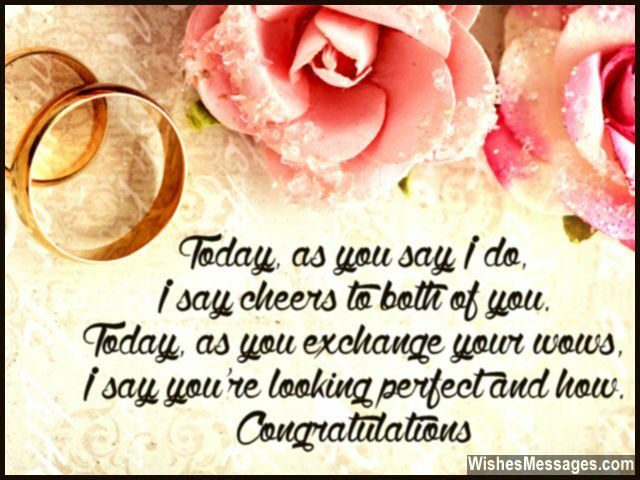 Wedding Quotes and Wishes: Looking for the perfect messages to say congratulations to a couple for getting married? 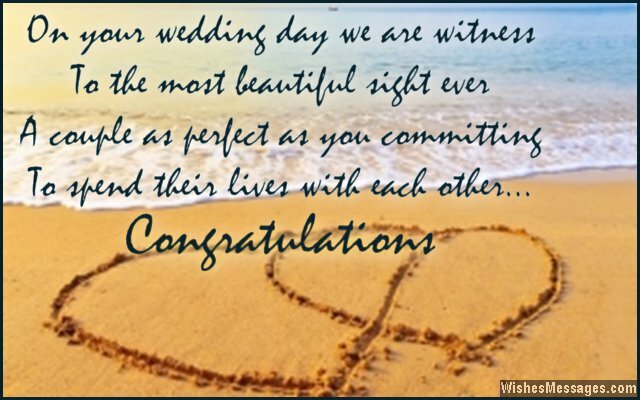 Mark the celebrations with beautiful quotes that embody the coming together of two hearts. 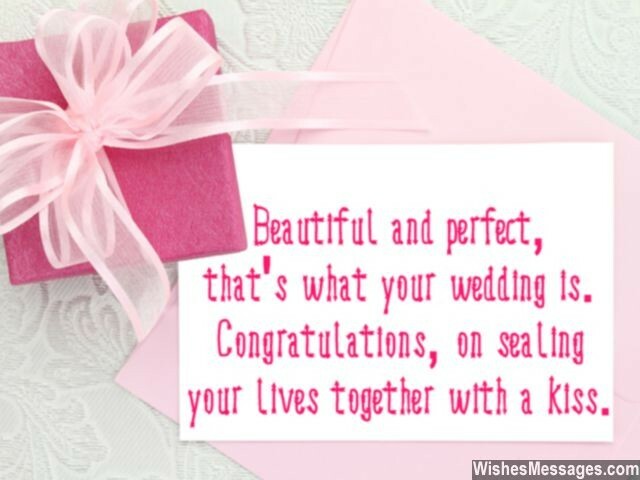 Write something cute on a greeting card and use the most touching words in your speech for the new husband and wife. Apart from the traditional hoopla, shower the newlyweds with your best wishes on Facebook and Twitter too. In the lead up to the big day, share the sweetest pins on Pinterest. Keep poking them with funny texts about walking down the aisle. Whether it is for your best friends, colleagues or someone in the family – do everything you can to make their journey a priceless one. After all, saying I Do is the beginning of a romantic saga unlike any other. 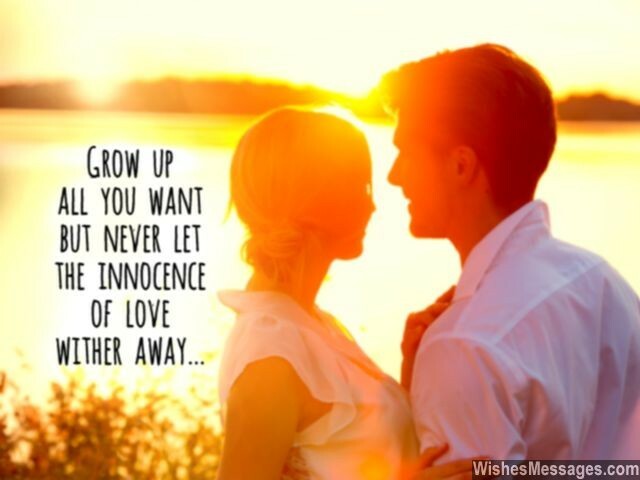 1) Grow up all you want but never let the innocence of love wither away. Congratulations. 2) A perfectly handsome groom is going to wed a perfectly beautiful wife at a perfectly delightful venue in the presence of perfectly caring friends like me. Congratulations for your perfect wedding. 3) I can’t seem to decide whether you are a match made in heaven, or your match makes everything seem heavenly. Congratulations on getting married. 4) Your wedding will be over in the blink of an eye but its memories will last a lifetime. Congratulations. 5) Congratulations for surrendering and succumbing to the greatest and the sweetest thing ever to have happened to you both – LOVE. 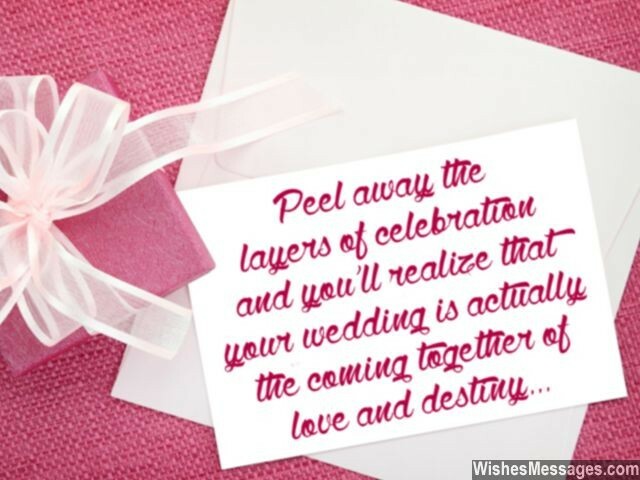 6) Peel away the layers of celebration and you will realize that your wedding is actually the coming together of love and destiny. Congratulations. 7) As you become man and wife, you will have two dreams to fulfill, two ambitions to achieve, two hearts to cherish and two lives to live to the fullest. 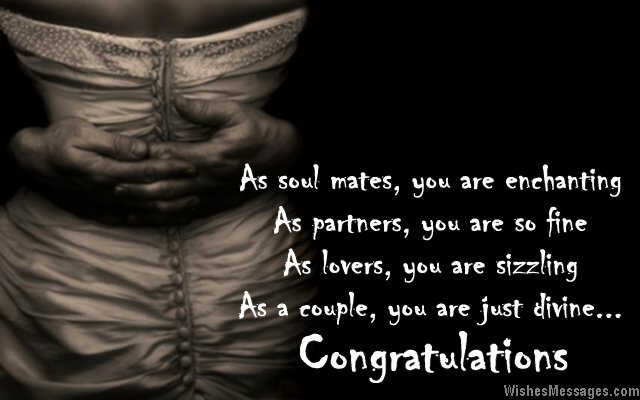 Congratulations for getting hitched. 8) Treat your wedding like a wine tasting session. Appreciate every note, nuance, complexity and flavor of your marriage to make it romantic, passionate and intoxicating. Congratulations. 10) I am pinning your picture on Pinterest, tweeting your wows on Twitter and posting your first dance on Instagram so that your wedding spreads happiness – just like you both do in real life. Congratulations. 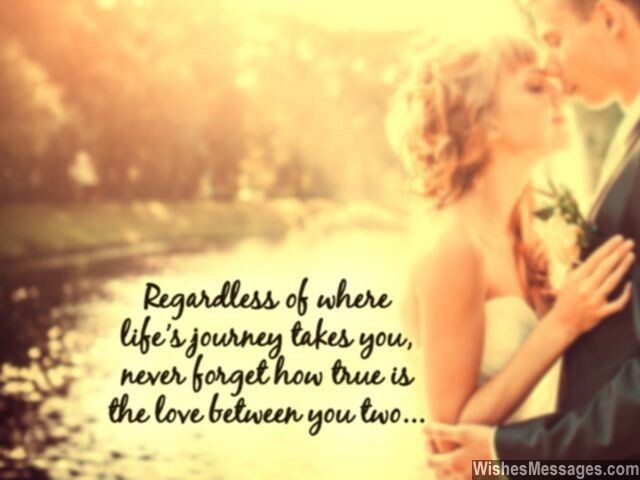 11) Regardless of where life’s journey takes you, never forget how true is the love between you two. Congratulations. 12) Fairytale weddings were a myth, until I saw the two of you getting married. Congratulations. 13) ‘I do’ is the first phrase in the couplet of marriage that makes the beautiful poem of life complete. Congratulations. 14) You have filled the world with envy – all the bachelors and the bachelorettes are so jealous of a pair as perfect ad you. Congratulations. 15) The pictures of your wedding must be archived and preserved because I doubt that another couple as beautiful as you both exists. Congratulations. 16) Today as you say I do, I say cheers to both of you. Today as you exchange your wows, I say you are looking perfect and how. Congratulations. 17) The beautiful wedding of a beautiful couple like you is proof that perfectness truly does exist. Congratulations. 18) The full form of your WEDDING is Wonderfully Elegant Delightfully Delicious Inspirational and Never-endingly Gorgeous. Congratulations. 19) The search for the most wanted person in your life finally comes to an end as you handcuff the thief who stole your heart with a wedding ring. Congratulations. 20) From saying boo as a baby to saying I do as a bride, you have come a long way girl. Congratulations. 21) Beautiful and perfect, that’s what your wedding is. Congratulations, on sealing your lives together with a kiss. 22) Because you have been Mad For Each Other until now, you are going to be Made For Each Other for the rest of your lives. Congratulations on your wedding. 23) There should be a big sign at the entrance of your house which says ‘Residence of the happiest couple in the world’. Congratulations on your wedding. 24) Think of your marriage as a rubber band. It will get stretched, pulled, twisted, tugged and bent as you go through life’s phases. But at the end of the day, it will still hold you together. Congratulations for getting married. 25) Your wedding may be a grand celebration but the greatest party of your life will come in the form of many blissfully happy years of married life that lie ahead. Congratulations. 26) As soul mates, you are the enchanting. As partners, you are so fine. As lovers, you are sizzling. As a couple, you are just divine. Congratulations. 27) There is a deeper meaning to how the colors of your jet black suit and your wife’s pristine white gown are opposite yet so complementing to each other. It signifies how the differences in your personalities will merge in-sync to complement each other in every walk of life. Congratulations for getting married. 28) Congratulations for putting in place the remaining pieces which will perfectly complete the puzzle of your lives. Have a happily married life. 29) Regardless of the weather, your wedding day is going to be the most beautiful day ever. After all, when a couple as gorgeous as you both tie the knot, everything else seems as pale as a rot. Congratulations. 30) You both are the epitome of true love and you both personify romance. Watching you both is a beautiful sight, that deserves more than just one glance. Congratulations. 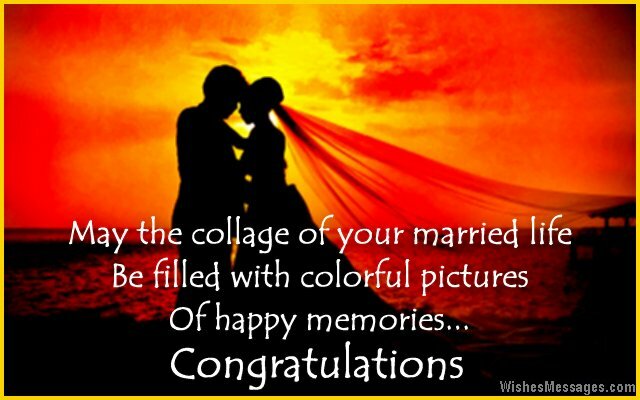 31) May the collage of your married life be filled with colorful pictures of happy memories. Congratulations on your wedding. 32) Today I have realized that I have made the wrong career choice. I should have been an astrologer because I predicted that you both would get married some day. My best wishes to you both. 33) No matter how beautiful the decor and setting of your wedding venue is, it will never be able to beat the beauty of a couple like you. Congratulations. 34) Has anyone ever called you both the toughest couple ever? I am today, because there is nothing that can break the strong bond you both share. Congratulations on getting married. 35) You are not a real prince and your wife is not a real princess. But if you always treat each other like royalty, you will be the happiest couple ever. Congratulations. 36) On your wedding day we are witness to the most beautiful sight ever – a couple as perfect as you committing to spend their lives with each other. Congratulations. 37) Just like the glass of bubbly used to raise this toast, may the bubbles of happiness always keep overflowing in your married lives. Congratulations. 38) Among the thousand steps that you have taken together in the journey of your lives and your relationship, your marriage has been the best one. Congratulations. 39) The moment you say ‘I do’ is when your love for each other will stop feeling like an adrenaline rush and start feeling like a bare necessity, without which you will not be able to live even a single day. Congratulations for getting married. 40) Your wedding is just a beginning and nothing more. Because a true love like yours can never have an end. Congratulations.